KA71 is a stereo headphone amplifier with additional function of stereo channels crossmixing. Designed for Amiga computers. 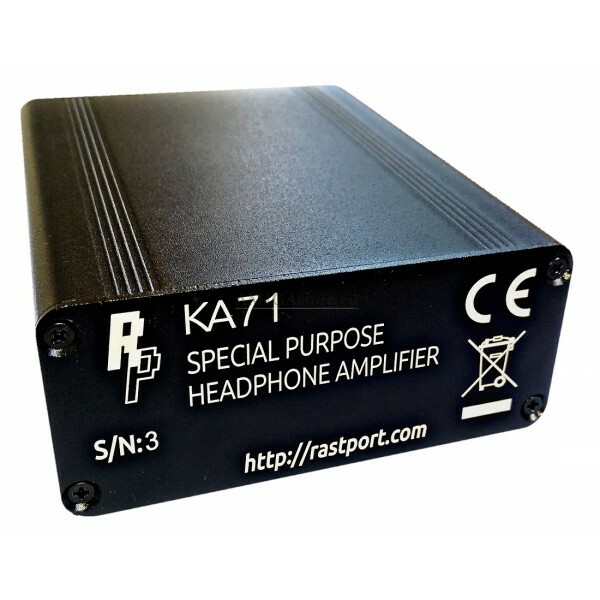 KA71 is a stereo headphone amplifier with additional function of stereo channels crossmixing. As such it is designed for Amiga computers. Amiga sound chip Paula sends two of its four audio channels to stereo left channel, two to the right channel. They are fully separated, which is annoying especially when listening with headphones. 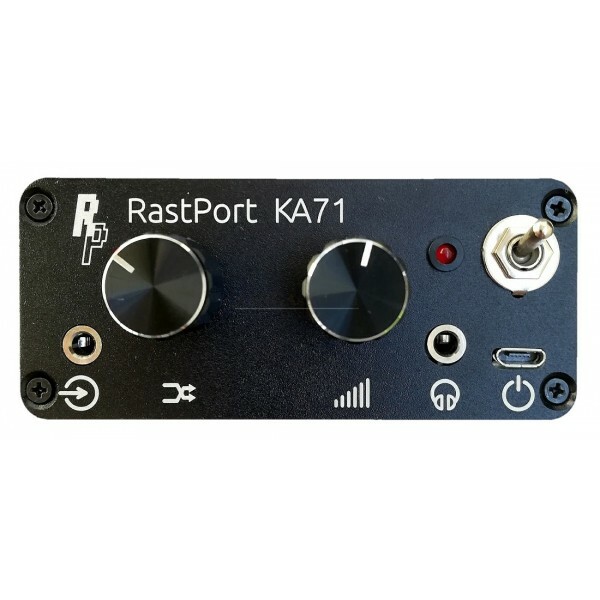 KA71 can mix stereo channels at a level adjustable with a knob, from full separation to mono output. It can be also used with computers having monophonic audio, or to mix two computers simultaneously playing parts of the same song. 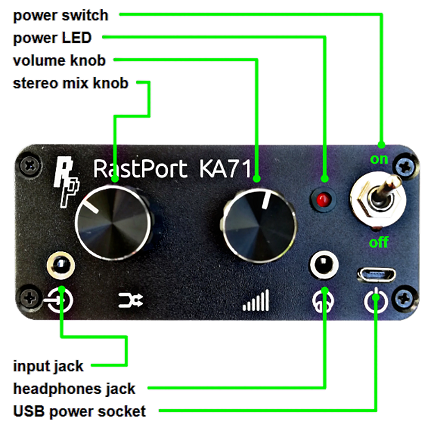 Of course one can also use KA71 as a regular headphone amplifier with smartphones, music players, computers and other sources. • Freely adjustable stereo channels crossmixing from pass through to full mono. 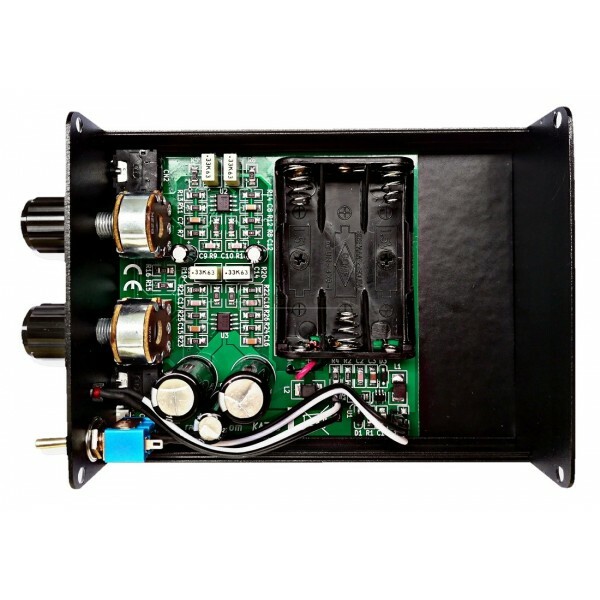 • Can be used as mixer/pre-amp for a loudspeaker power amplifier or active loudspeakers. • High output power, able to drive high-impedance phones. • High audio quality, low distortions, low noise, wide bandwidth (10 Hz to 30 kHz). • May be powered either via micro USB socket (from computer, USB hub, phone charger, powerbank), or 3 AAA batteries (one use or rechargeable). • Batteries need not to be removed when using USB power, they are disconnected automatically. • Selected high quality components. Only polyester and HQ aluminum electrolytic capacitors in the audio path. • Modern design using mostly SMD parts. The amplifier may be powered from USB or from batteries. It has a standard micro USB type B socket, the same as used in most of smartphones and tablets. 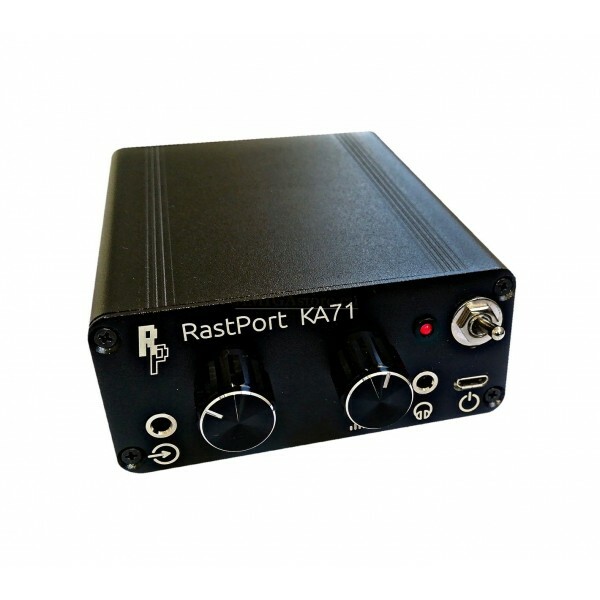 Power requirements of KA71 are low, so it may be powered from any desktop computer, laptop, USB hub, phone charger or powerbank, using standard USB type A to micro USB type B cable. The amplifier only uses USB power, data lines are not connected inside. In case when batteries are inserted and USB power is connected at the same time, batteries are automatically disconnected, so the device works on USB power. Then there is no need to remove batteries each time USB power is used. • Disconnect all the cables, switch off the power switch. • Unscrew two front upper screws. Use a screwdriver with Phillips size 1 (PH1) tip. • Unscrew two rear upper screws. • Pull the upper half of enclosure up. It is not connected to anything. • Remove old batteries if any (new amplifier comes without batteries installed). • Insert new batteries, observing polarity, which is shown on the holder. If not sure, negative terminals should contact with springs. • Put back the upper half of enclosure. Note that it only fits one way, you may need to turn it by 180°. • Carefully screw in the screws. Note that a steel screw may damage aluminum thread easily. Start with bare hand, use screwdriver after making a few turns. Avoid excessive tightening. • Verify that power LED lits when the power switch is switched on. • Even if you use rechargeable batteries, they are not being charged while USB power is connected. To recharge them you have to remove them from KA71 and use a standalone charger for NiMH batteries. • Do not keep discharged batteries inside the device for a long time. Battery leak may seriously damage the amplifier. • Weight: 235 g (without batteries). • Socket: mini jack 3.5 mm stereo. • Input impedance: 50 kΩ. • Maximum input signal amplitude: 5 Vp-p.
- Less than 0.05% in the whole passband. • Type: USB 5 V (via micro USB type B socket) or 3 × AAA cells inside, rechargeable (NiCd, NiMH) or single use (zinc, alkaline). • Batteries cut-off voltage: 2.7 V (0.9 V per cell). - Rechargeable 750 mAh NiMH cells: 20 hours. For more Technical Specifications and Schematic Diagrams, please visit the manufacturer's website.